The excerpts included below present a real-world example of bending science to hide unwelcome, inconvenient scientific results, conclusions and truth. The sources of this example include: 1) Bending Science: How special interests corrupt public health research and 2) Scientific American, "Doubt is Their Product" Consequently, while reading these excerpts, mentally compare NCFM Snurra/eSnurra Groups' "bending" the reporting of the risk of perinatal death which results from changing LMPD-based EDD by >=14 days with Merk Corporation hiding a "five-fold increase in the risk of heart attack" for users of the painkiller Vioxx relative to users of naproxen [sold under the brand name Aleve]. Bending Science "Chapter 4. Shaping Science: The Art of Creating Research to Fit One's Needs"
"In what we characterize as a separatist view of the world (Figure 1) scientific research is sufficiently reliable for use in legal proceedings and important public policy deliberations after it flows out of the realm of science through a pipeline in which those inhabiting the realm of science (often referred to as the “scientific community”) have the opportunity to screen the relevant scientific studies to ensure that they are produced in accordance with the norms and procedures of science. Within the pipeline, the following scenario ordinarily plays out: scientists conduct research in accordance with a predetermined research protocol; they gather the relevant data; they analyze and interpret the data; they write up the data, analysis and conclusions and submit a manuscript to a scientific journal for publication; the journal, prior to acceptance, subjects the paper to peer review; the scientists respond to the reviews by making any necessary changes; and the journal publishes the paper. If the paper has important scientific implications and attracts sufficient attention, it will undergo additional scientific scrutiny. Other scientists may publish letters in the journals critiquing or expanding upon some aspect of the paper; it may become incorporated into a “review article” summarizing the published work in a particular area of research and drawing additional conclusions; it may play a role in a report prepared by an expert body like a “blue ribbon panel” examining a scientific topic of some social relevance; and summaries of the article or the panel report may get broadly disseminated by the media to scientists, decision-makers and the public. The separatist view does not seem to contemplate the possibility that the otherwise legitimate process of generating and refining scientific studies within the pipeline could become contaminated by outsiders with an economic or ideological stake in the ongoing legal, regulatory and policy debates. 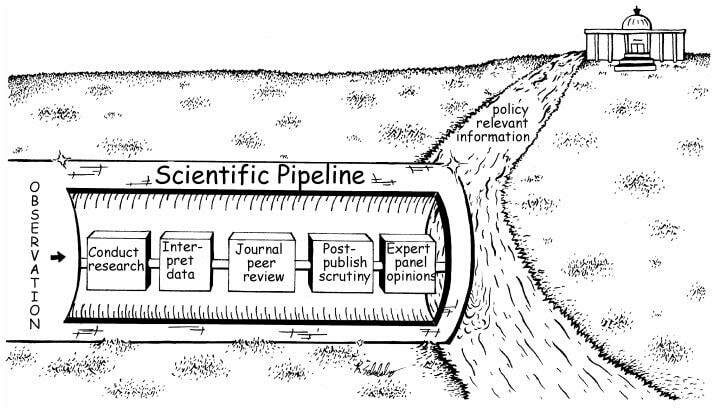 Instead, it assumes that the “scientific community” ensures, through rigorous peer review and professional oversight, that the scientific work that exits the pipeline is reliable and generally uncontaminated by biasing influences like the economic or ideological preferences of the sponsor of the research. Separatists are quick to acknowledge that once science enters the realm of policy, it becomes the plaything of advocates. And from that point on, it is Katy-bar-the-door [a warning of the approach of trouble]. As attorneys in litigation and interest groups in regulatory proceedings and policy debates seize on research that is relevant to their causes, they manipulate it however they can to achieve preferred judicial, regulatory and legislative outcomes. 3 But, separatists seem confident that these outcome-oriented strategies are readily identified and excluded within the realm of science before they have a chance to corrupt the pipeline’s output. 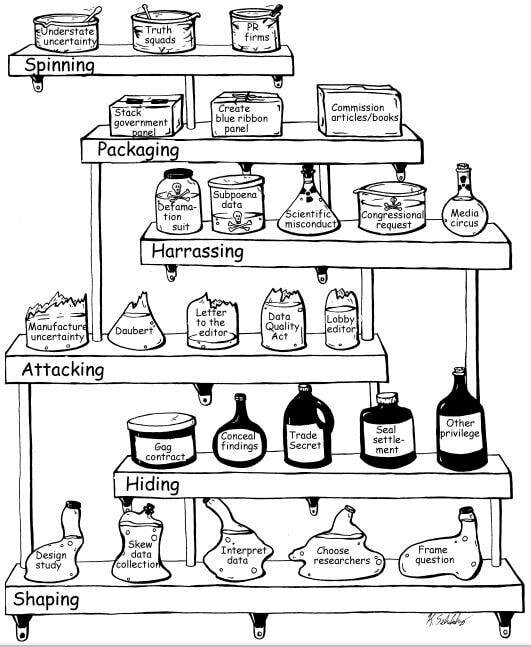 If it accomplishes nothing else, this book [Bending Science: How special interests corrupt public health research] should demonstrate that the separatist view is an idyllic, even Polyannaish view of the interaction between science and policy in the hotly contested areas of public health and environmental regulation and litigation. In the real world, 4 each step in the science pipeline can become seriously contaminated by the efforts of advocates who are responding to incentives and pressures from within the realm of policy. In this more realistic view, advocates infiltrate the pipeline and secretly situate themselves at various key points to ensure that the research, the critiques, the panel reports, and the overall messages match their ends. In other cases, they undermine the work of scientists who persist in conducting research that runs contrary to their goals. 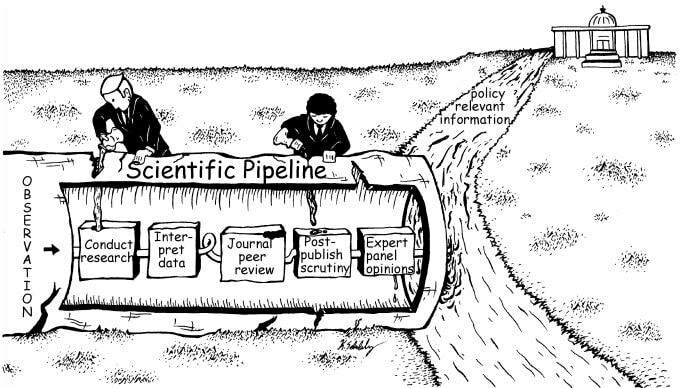 After the science exits the pipeline, the advocates continue their efforts but shift their focus to manipulate public perceptions about the research as it becomes available for use in the policy realm. In this alternate view, science no longer proceeds in a straight and insulated path through a closely supervised pipeline of scientific oversight; the pipeline is instead much more porous and vulnerable to a range of tricks developed by determined advocates to bend science to their own ends. Figure 2 charts out the numerous points of entry where special interests can infiltrate the pipeline and manipulate the normal processes of science, often without detection by the scientific assembly line of internal checks and review stations. Instead of a process that has managed to insulate itself from the unruly world of policy, then, sacred scientific processes are contaminated by determined advocates who understand the power of supportive science in legal and policy proceedings. Indeed, since published results and peer review statements carry the highest indicia of reliability and authority, it is on these products that advocates tend to focus most intensely. Perhaps because they assume that the pipeline produces results that are largely insulated from contamination by advocates, the institutions of government––courts, executive branch agencies and the Congress––employ processes that not only neglect to deter efforts by advocates to bend science but might actually make it worse. Each of these legal institutions depends heavily on advocates to select the scientific information used in their decisions, and they employ surprisingly few mechanisms to screen out unscientific outcome-oriented research. Worse, the adversarial nature of the legal system actually encourages advocates to invade the realm of science––urreptitiously, because they are not especially welcome there––to commission research and manipulate scientific quality control procedures in outcome-oriented ways. Ironically, this in turn creates even greater distance between independent researchers and bent science. Since outcome-oriented research is antithetical to science, independent scientists generally avoid both the science and the scientists who they know to be involved in producing it. This leads to an adverse selection of sorts, with the institutions in the policy realm equipped with only limited trusted expert assistance in separating the legitimate scientific research exiting the pipeline from research that has become contaminated by advocates. In many cases, scientists who leave the scientific realm to make their expertise available to institutions in the policy realm are in fact employed by advocates for the purpose of advocacy, not for the purpose of helping governmental institutions arrive at the scientific truth. Worst of all, some independent scientists whose work informs policy may find themselves on the receiving end of harassing attacks from other scientists who, unbeknownst to them, have been hired by advocates to deconstruct their work. The reluctance of independent scientists to involve themselves in the scientific review of and policy debates over outcome-oriented research plays into the hands of the advocates because it allows them to maintain the separatist illusion, knowing full-well that it does not reflect reality. Although the advocates did not by any means originate the separatist worldview, they carefully nurture it in the realm of policy because it allows them to take the position that decisions in the policy realm should be based on “sound science,” rather than on precautionary policies, while at the same time retaining a powerful influence over the “science” that drives those decisions. The final result is a train wreck of sorts with regard to a broad range of public health and environmental issues as inaccurate separatist idealizations of science collide with the reality of “science-based advocacy.” This book documents the collision and explains the forces that have produced it. The final three chapters offer suggestions for cleaning up the resulting mess and avoiding similar collisions in the future. The scientific ideal is, of course, just that, and deviations are not uncommon, even in independently conducted basic research. Scientists face pressures to bend research in outcome-oriented directions quite apart from incentives that emanate from the realm of policy. Scientific careers in academia and industry depend upon successful completion of research and, in the case of academia, frequent publication of research output. Research that yields unexpected outcomes or “breakthroughs” can generate great rewards, both reputational and financial, for the scientists who produce the research. Scientists are not above yielding to these pressures by surreptitiously departing from scientific norms. 10 Indeed, reports of overt scientific fraud have stimulated activity in the legal system to deal with such issues in the context of publicly supported research. 11 Even apart from these rare instances of overt fraud, well-intentioned scientists are human beings with their own biases that may be reflected in their work product. 12 Many scientists have formed very strong opinions about how the universe functions in the particular micro-segment of the universe to which they devote their research efforts, and they may consciously or unconsciously avoid or denigrate research outcomes that vary from those preconceived opinions. 13 A scientist who has demonstrated a commitment to a particular view of the world is, of course, a prime target for advocates who are always on the lookout for experts whose views line up with their economic or ideological interests and who might be willing to engage in research, sit on government advisory committees, and serve as expert witnesses. Bent science can also occur at later stages of the research pipeline. Scientists regularly interpret and critique the research of other scientists, write review articles and books incorporating many individual studies into a broader body of research, and sit on advisory committees that summarize research in reports designed to be comprehensible to lay decisionmakers and the public. When advocates intervene into this process by commissioning books and review articles, assembling “blue ribbon” panels, or nominating scientists whose views comport with their interests to advisory committees, they are bending science in an indirect and perhaps less influential way than when they bend the research itself, but the output is nevertheless bent science. The captions of the shelf items in Figure 3 above are included below for legibility.